For the first time since 2000 the Davidson football program is off to a 3-0 start. The Wildcats under first-year head coach Scott Abell picked up their third win in as many games in record-setting style. Playing their scheduled game with Guilford two days early because of Hurricane Florence, Davidson assaulted the NCAA FCS and school record book to the tune of two national record and eight school marks in scoring 91 points against a team that scored 61 for the second consecutive week. To learn more details about the records Davidson set, check out the Uplifting Athletes Rare Performance of the Week Award. All those records are nice, but the only number that matters for Davidson is adding another victory to its 2018 to ledger after the Wildcats won only four games the last two years combined. Northwestern Chapter leader Peter Snodgrass is featured this week in our Beyond The Trophy series. Syracuse: The Orange won for the first time without the full services of starting quarterback Eric Dungey, who went down with an injury in the second quarter and did not return. Back-up signal caller Tommy DeVito came off the bench to complete 11 of 16 passes for 144 yards with a touchdown and the Syracuse defense limited Florida State to fewer than 250 total yards to improve to 3-0. Penn State: Senior quarterback Trace McSorley accounted for five touchdowns (three rushing, two passing), went over 1,000 rushing yards for his career and became the Nittany Lions all-time leading rushing touchdown leader for quarterbacks in a blowout of Kent State. Stony Brook: Backstopped by a defense that limited Fordham to minus-7 yards rushing to win its second game in a row after dropping the opener. Jordan Gowins and Donald Liotine each eclipsed 100 yards on the ground with a touchdown for the Seawolves. Clemson: Tigers defensive end Clelin Ferrell helped the Tigers defense shut down Georgia Southern’s offense with a pair of sacks, 2.5 tackles for a loss and seven total tackles. The Eagles finished with fewer than 150 total yards against a Clemson offense that rolled up nearly 600 total yards. 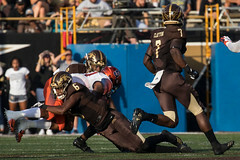 Western Michigan: The Broncos piled up more than 500 total yards of offense and 68 points to win its first game of the season. 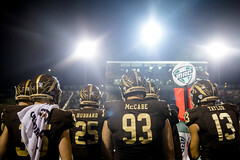 Western Michigan’s defense not only shut out the Hornets, but limited them to five first downs and 123 yards. QB Jon Wassink spread the ball around to seven different receivers to finish with 286 yards and a couple touchdowns. Notre Dame: The Fighting Irish continue to win games despite struggles putting points on the board. The Notre Dame defense produced three key turnovers and held Vanderbilt to fewer than 100 yards on the ground to improve to 3-0. Princeton: This is the 150th season of football for the Tigers and Princeton opened with style by scoring 44 first-half points. WR Jesper Horsted had a monster opening two quarters with seven catches for 140 yards and a pair of touchdowns. RB Charlie Volker chipped in with 162 on only 14 carries with two touchdowns as well. This entry was posted in Clemson, Davidson, Florida State, Fordham, Notre Dame, Penn State, Princeton, Stony Brook, Syracuse, Uplifting Athletes, Western Michigan. Bookmark the permalink.